WE CLEAN YOUR FILTERS WHERE OTHERS NEGLECT THEM GUARANTEED! ​indoor air quality as well. According to the National Fire Protection Association, most fires in commercial kitchens are caused by cooking flames that flare up and penetrate your filters where grease deposits have accumulated. National Fire Protection # 96 standards. The grease filters within your kitchen exhaust system exist to reduce the amount of vaporized grease that ends up within your exhaust system ducts, where it can cause a flash fire. Clean filters can trap up to 70-80 percent of the grease passing through them. 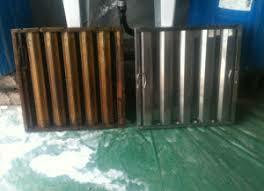 But if your filters are already saturated with grease, they can’t do their job properly and you will end up with reduced efficiency of your system and a dangerous grease accumulation right above your cooking appliances. Investing in a regular grease filter replacement/exchange program as well as cleaning will help reduce your risk of fire and avoid its potentially devastating impact on your business. M&N Hood Cleaning Services inc. offers a quick, convenient, affordable filter exchange program that lets you take the hassle out of keeping up with grease filter maintenance. and will also help keep your system running efficiently as possible.